Navcam Left image looking along the back edge of the Vera Rubin Ridge (top left to top centre) down into the clay-bearing unit. 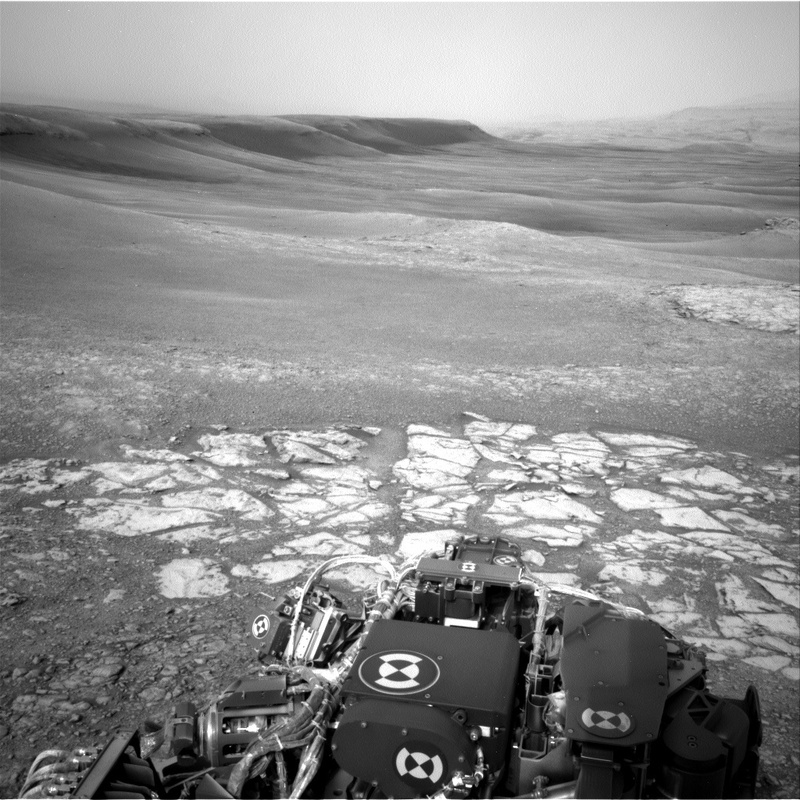 Curiosity is on the brink of descending down off the Vera Rubin Ridge (VRR) onto the clay-bearing unit. We are hoping to 'beam up' lots of interesting new data to the Mars orbiters, to be relayed to Earth after executing our plan on Mars tosol. We planned a typical 'Touch and Go' sol today, which includes using the arm to place our contact science instruments (APXS and MAHLI) on a rock target to document chemistry and texture, followed by remote science by ChemCam and Mastcam to also look at chemistry and the larger scale view out the front window, before a drive. We are documenting how the chemistry and appearance of the rock is changing as we transition from the resistant VRR to the less resistant, orbitally distinct clay-bearing unit, and taking larger-scale images and mosaics to assist in future planning of our investigation of the clay-bearing unit. We chose a reddish-purple, laminated bedrock target for APXS and MAHLI and selected the name "Linlithgow," which is apparently the birthplace of Mary Queen of Scots and the future birthplace (in 2222) of Montgomery "Scotty" Scott, chief engineer of Star Trek's Enterprise (hence the title)! The great grandfather of one of our science team members also compiled an anthology of poetry from the area in 1896, so a popular choice of name! Mastcam images will be taken of this target and an adjacent, rougher textured and different coloured bedrock target, "Stoneywood" (also a ChemCam target), to look for spectral variations between the two areas. The more typical bedrock target, "Stornoway" will also be analyzed for composition by ChemCam. A large Mastcam mosaic of 21x2 images was also planned of an area named "Boyndie Bay" to document some interesting features that we are thinking of visiting during our investigation of the clay-bearing unit. The planned drive should take us to the very edge of the VRR, and will likely be our last stop before we drive down onto the clay-bearing unit. We are acquiring images to facilitate a full weekend of science activities at this important location, as well as a post-drive DAN active measurement to investigate the distribution of subsurface hydrogen. Additional Mastcam images and REMS meteorological observations were planned to monitor dust in the Martian atmosphere.